Rent or buy Sherlock Holmes here. Sir Arthur Conan Doyle’s classic crime-solver has been portrayed on film more than any other literary figure. 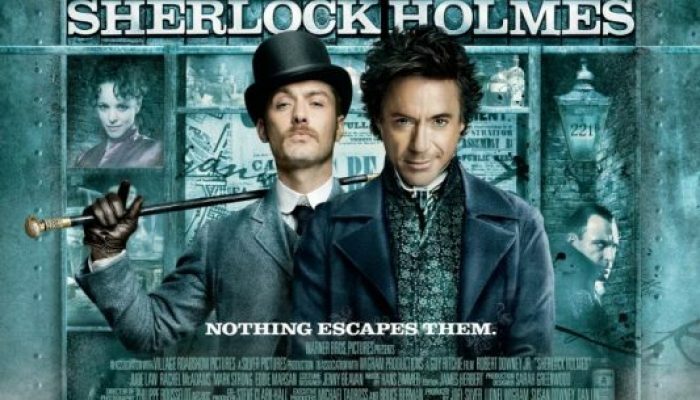 The new version, starring Robert Downey Jr. as Holmes and Jude Law as Watson, has marketed the sleuth as an action hero instead of an intellectual. To my pleasant surprise, the film itself is true to its source material and Holmes’ legendary mind is front and center in the narrative. The recreation of turn-of-the-century London is exquisite in its detail and the story builds steam as it goes on (indeed, I found myself enjoying it more and more as it progressed). Downey, an American, flawlessly portrays the British lead, while Law’s Watson is portrayed as less of a sidekick and more of a partner. The two have fantastic buddy chemistry, and their good-natured bickering is a delight. Parents should be aware that this PG-13 film, while very light on offensive language and sexuality (a woman’s bare back is seen, as is a man’s bare chest in a different scene, and there is one innuendo) does have a good deal of action violence and some blood. Also, the storyline involves the occult, which is displayed as evil and to be combated, but its portrayal may still make some uncomfortable. Sherlock Holmes comes recommended to those who enjoy action films with substance. For another smart blend of mystery, thriller, and martial arts check out The Manchurian Candidate! Rent or buy it here.